As a Christian, I understand what the question proposed in this passage means. When you know Jesus and you encounter Him, you experience a love that only He generates in your heart. 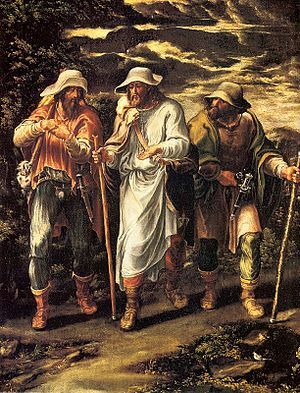 Luke 24:13 Now that same day two of them were going to a village called Emmaus, about seven miles from Jerusalem. 24:14 They were talking with each other about everything that had happened. 24:15 As they talked and discussed these things with each other, Jesus himself came up and walked along with them; 24:16 but they were kept from recognizing him. 24:17 He asked them, “What are you discussing together as you walk along?” They stood still, their faces downcast. 24:18 One of them, named Cleopas, asked him, “Are you the only one visiting Jerusalem who does not know the things that have happened there in these days?” 24:19 “What things?” he asked. “About Jesus of Nazareth,” they replied. “He was a prophet, powerful in word and deed before God and all the people. 24:20 The chief priests and our rulers handed him over to be sentenced to death, and they crucified him; 24:21 but we had hoped that he was the one who was going to redeem Israel. And what is more, it is the third day since all this took place. 24:22 In addition, some of our women amazed us. They went to the tomb early this morning 24:23 but didn’t find his body. They came and told us that they had seen a vision of angels, who said he was alive. 24:24 Then some of our companions went to the tomb and found it just as the women had said, but they did not see Jesus.” 24:25 He said to them, “How foolish you are, and how slow to believe all that the prophets have spoken! 24:26 Did not the Messiah have to suffer these things and then enter his glory?” 24:27 And beginning with Moses and all the Prophets, he explained to them what was said in all the Scriptures concerning himself. 24:28 As they approached the village to which they were going, Jesus continued on as if he were going farther. 24:29 But they urged him strongly, “Stay with us, for it is nearly evening; the day is almost over.” So he went in to stay with them. 24:30 When he was at the table with them, he took bread, gave thanks, broke it and began to give it to them. 24:31 Then their eyes were opened and they recognized him, and he disappeared from their sight. 24:32 They asked each other, “Were not our hearts burning within us while he talked with us on the road and opened the Scriptures to us?” 24:33 They got up and returned at once to Jerusalem. There they found the Eleven and those with them, assembled together 24:34 and saying, “It is true! The Lord has risen and has appeared to Simon.” 24:35 Then the two told what had happened on the way, and how Jesus was recognized by them when he broke the bread.